Google Chrome handles each tab separately and also monitors every extension and plugin process separately. This makes the browser more stable and does not affect the performance if any one tab or extension or a add on freezes or does not respond. If you have installed many extensions and multiple open tabs, you may encounter the lag in performance of Google Chrome. Sometimes, we do not use all the extensions that we have installed. Some extensions and plugins keep using system resources even if we are not using them at all. Some web pages also uses more memory and processing power. It is always better to kill those processes which causes problem to Chrome performance. 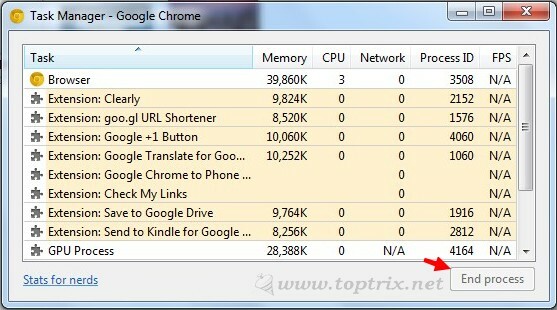 You can easily find and kill every tab, extension, add on or any other browser process and sort them on the basis of memory usage and processor usage. 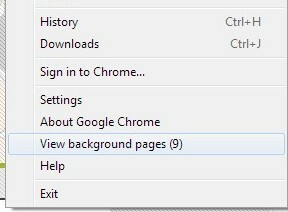 To find out, go to Google Chrome menu and select "View background pages' option. The task column lists all the installed and enabled extensions as well as all open tabs, processes and addons currently using system resources and interacting with the browser. It will kill the process. When you kill the process, a notification will be displayed. You can also use this task manager to find your the page loading speed, just reload the open tab or open a new tab and see the network column. This is a exclusive feature of Google Chrome and other browser does not provide such interface. This way you can easily close any specific tab that is not responding or a extension that is creating problem or also a flash add-on that is not running properly. Do you have any other method to kill the processes and keep your favourite browser running? Please share with me.